The festival of Navratri holds a great significance for Hindus. These are the days when the Hindu community completely permeates itself into sanity. Most of the believers of the religion do away with their eating habits and maintain it till the 9 days. Many folks do fasting to please the goddess. For each day, a form of the goddess Durga is worshipped. On the day one manifestation of goddess Durga Shailputri is worshipped. The second day it is Brahmacharini, on day three Devi Chandraghanta, on fourth Kushmanda, on fifth Skanda Mata, on sixth Katyayani, seventh Devi Kalaratri, Eight Mahagauri and ninth Siddhidatri. Apart from these, the best part about Navratri falling in September and October are Garba and Dandiya nights. These are the fun nights where families enjoy within themselves. It’s a great time for the folks to reunite and dance, enjoy, shout and try all the crazy things which they refrain from doing otherwise. Garba and Dandiya are basically a form of dance which is played with hands and sticks respectively. It’s a way to show devotion towards the almighty. 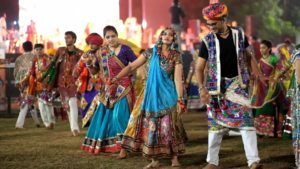 Both Garba and Dandiya originated from Gujarat, India. It’s famously played in Ahmedabad and this is where it became famous all over the world. 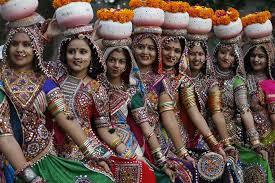 Garba is derived from the Sanskrit word Garbh, which means a womb. Garba and Dandiya are the manifestations of Lord Krishna’s Raas, which he had with his Gopis. The Raas transcends the physical love and it’s all eternal. The best form of Garba is the Garba in Ahmedabad. The city has its own style of playing it. There are huge grounds lit with dim lightings and music playing at higher decibels. It’s just the matter of the traditional Gujarati music with beats that allow people to let go of their inhibitions. Family members, relatives, society people, everyone come together and celebrate it. A tremendous scene is on offer when a young person strikes a clap with an elderly. In Ahmedabad, people like to keep it classy and they make it a point to dress up in particular attire. The costumes are all decked up with mirror work, beads, colourful threads, tassel etc which is coupled up with metal work done on it intricately. Both women, there’s ghagra-blouse and chaniya choli with a chunni; whereas for men, it’s dhoti and a kurta with a colourful headgear. Women team up their attire with beautiful metal ornaments that sparkle in the lights. The public in the city is all elated and charming during the Garba in Ahmedabad. The radiant faces of people tell you the tale that they are the trailblazers of the celebration.